It’s Saturday morning and its time to grab a drink, sit, and chill out in the sun as we prepare for the start of another outstanding day of live music. First up on the main stage is Waterparks (7), who apparently are ‘God’s favourite band’ according to their backdrop which quite the statement. The Pop-Punks shake of the Saturday hangovers and wake up those who have found their way to the arena with the likes of ‘Blond’, ‘crave’ and ‘Take Her To The Moon’ as the frontman Awsten Knight is particularly demanding of the crowd making sure everyone is involved. It’s the first time we’ve seen Waterparks live and they strike familiarities with the likes of All Time Low back when they played in 2010. So if the stick at it maybe they could be the World’s favourite band as well as God’s. 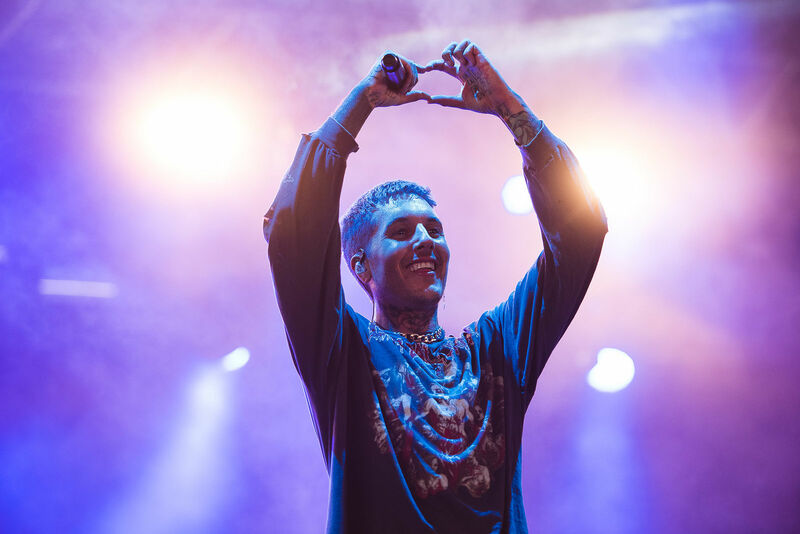 A change of pace over at the Radio 1 stage for a ‘secret set’ listed as ‘An Invitation To Salvation’ on the line up is heavily rumoured to be the return of Bring Me The Horizon (10). After leaving clues around the UK over the past month including billboards asking ‘Do you want to start a cult?’ they finally dropped a brand new song titled ‘Mantra’ which looks to be BMTH back at their very best. It’s this song that rings out on the Radio 1 stage as we arrive to a packed out tent, probably the busiest we’ve ever seen it this early. The Sheffield Alt Rock/Metal outfit tear through a furious set of their best tracks from their last album ‘That’s The Spirit’ and a few from ‘Sempiternal’ to keep everyone on their toes. Huge circle pits break out from song to song causing a whirlwind of dirt and dust to be thrown up in the air leaving everyone choking in the pit as they catch their breath to sing along at the tops of their voices. One moment finds the crowd leaning down on one knee saluting the frontman as though they stand beneath a God. If their new album is to be as good as their new single ‘Mantra’ then Bring Me The Horizon could very well become Gods. After Bring Me The Horizon the Radio 1 tent literally empties leaving next to nobody inside. 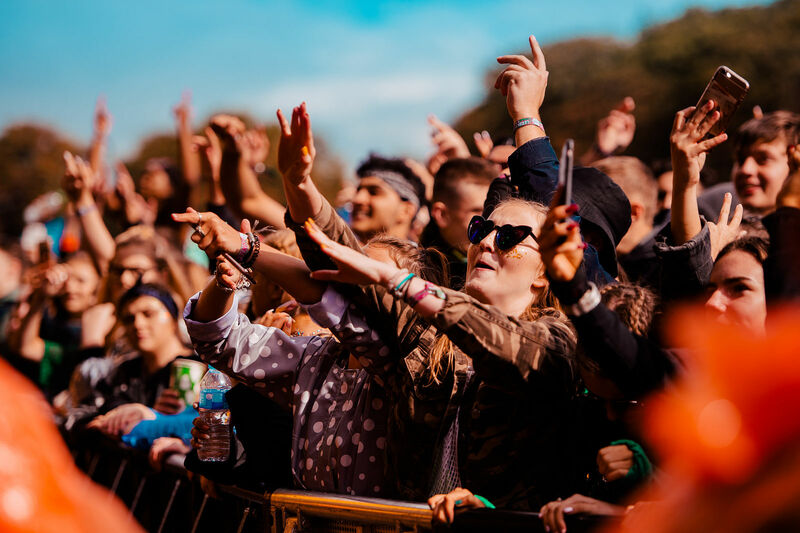 The reason for this is purely down to the fact that Post Malone is set to take on the Main stage to one of the biggest crowds of the weekend. But we’re not drawn into the hype. Instead we stick around to catch Fickle Friends (7) treat us to some indie pop to wind down and feel all summery. Front Woman Natassja Shiner seemed to get a little carried away at Reading Festival, so today in Leeds she is propped up on a stool on crutches centre stage as she ‘channels her inner Dave Grohl’. 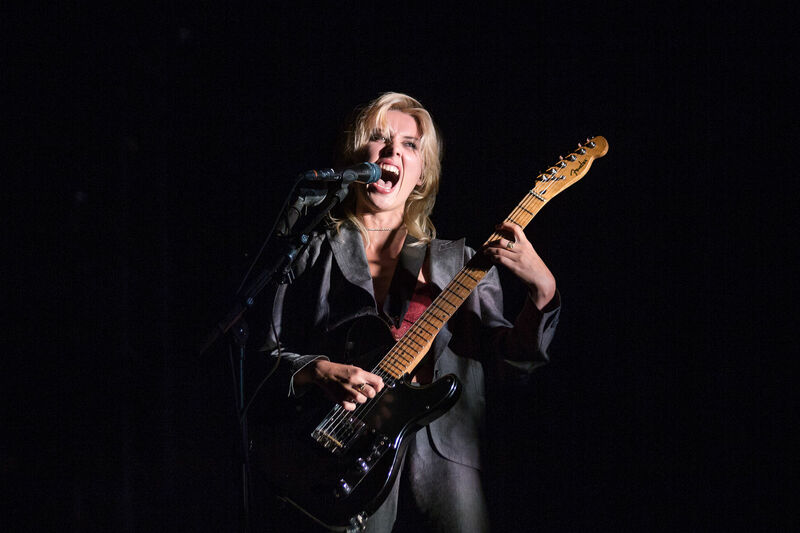 Even though the injury may hold back the frontwoman from having that little bit more of a stage presence, she still does fantastically well and her vocals are on point. There may be only a few hundred people willing to miss Post Malone but they are rewarded with a brilliant set. ‘Say No More’ is one of our favourites from the set and has everyone singing along. Many would crumble in their situation but Fickle Friends took it with a pinch of Salt and delivered a strong performance. 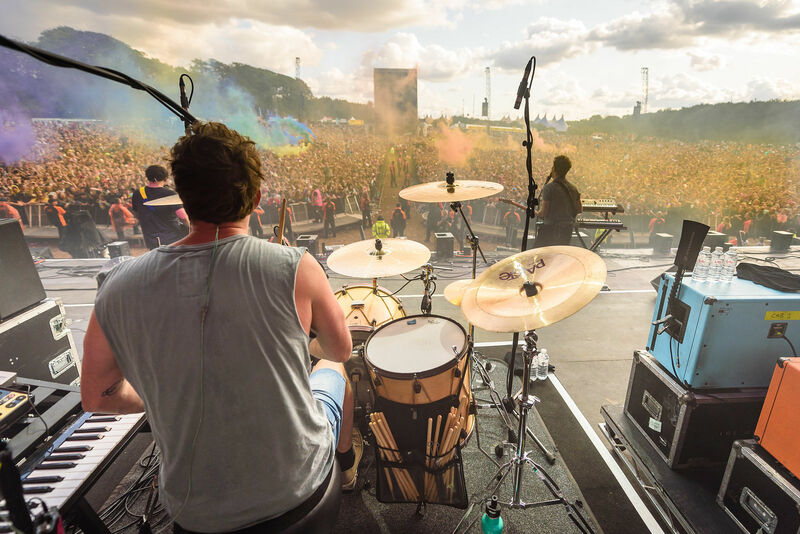 Back over to the Main stage in the sun for a sing along with Liverpool’s finest The Wombats (8.5) who take us on a blast to the past with the likes of ‘Moving To New York’, and ‘Let’s Dance In Joy Division’ to get everyone feeling those summer festival vibes. Their stage production includes a few Wombat mascots and some bright interesting Wombat themed visuals only to add to the performance. It’s Flares galore as the sky fills with coloured smoke throughout their set and new tracks such as ‘Turn’ sound incredible live. With a huge headline tour announced for the end of the year we’re sure The Wombats will continue to be a crowd pleaser for some time to come. We as many others decided to stick around at the main stage for The Kooks (7). They may not have been able to up The Wombats, but they gave them a good run. 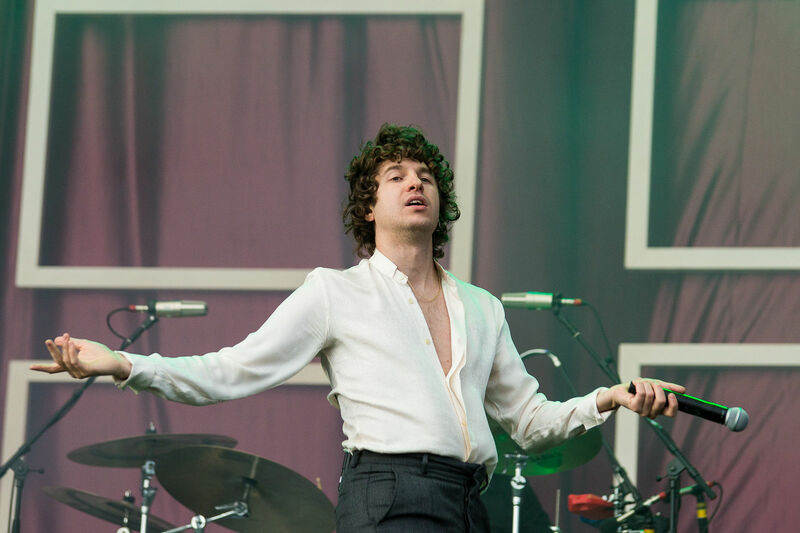 With solid tracks such as ‘Bad Habit’, ‘Shine On’ and ‘She Moves In Her Own Way’, The Kooks are more than equipped for a festival singalong. ‘Naïve’ Closes out the set with everyone singing in the rain one last time as the Indie Rockers look more than satisfied with the turnout. Nothing But Thieves (10) are soaring right now. After the release of their second full length album ‘ Broken Machine’ last year, Nothing But Thieves have blown themselves into the eye line of many, and a sub-headline set is everything they deserve for their efforts. A packed out Radio1 Stage looks on as the silhouettes of the Essex lads take their positions and the sound of ‘I Was Just A Kid’ gets things off to a flier. It’s clear from the off that Nothing But Thieves really have that something special for their live sets, whether it be that togetherness and understanding of one another, or simply to the fact that frontman Connor Mason’s vocal range is impeccable. 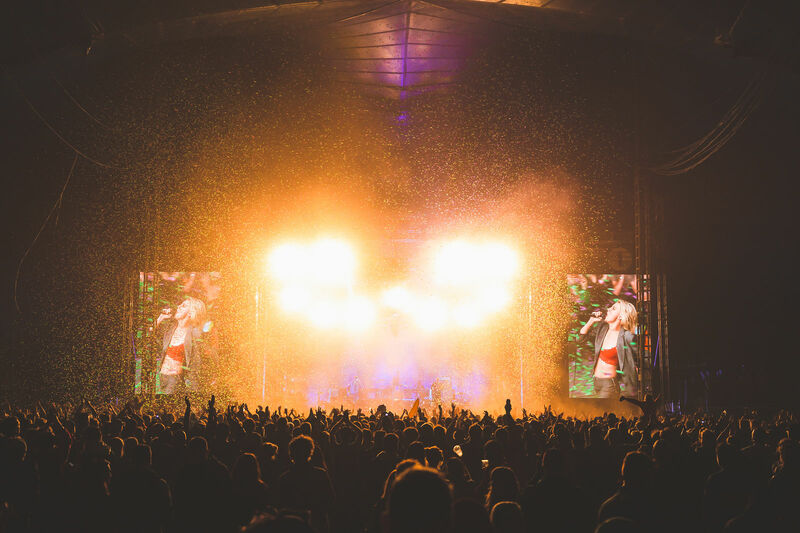 As per BMTH’s set earlier in the Radio 1 stage, a whirlwind of dirt and dust lies thick in the air as the crowd loose themselves in the mosh pits at many stages throughout their set leaving us all gasping for air, but it was definitely worth it! ‘Trip Switch’, ‘Sorry’ and the incredible ‘Amsterdam’ all boasted highlights from the set as NBT make life difficult for Wolf Alice following. One of if not the strongest sets of the day. Fall Out Boy (9.5) burst back onto the scene earlier this year with their fantastic new album ‘Mania’, packed with powerful pop-punk bangers with infectious choruses to keep us gripped from start to finish. Much like the new album, Fall Out Boy’s live set is equally as gripping. With seven studio albums worth of music to throw around for fun, Fall Out Boy’s set list is bursting at the seams with hits. The likes of ‘Sugar We’re Going Down’, ‘Dance, Dance’ and ‘Thnks fr th Mmrs’ all take us on a rollercoaster of nostalgia, where as ‘Wilson’, ‘The Last Of The Real Ones’ and ‘Centuries’ all show us the Chicago quartet still have plenty to offer in the later stages of their musical careers. The show dives further than just the music, as the production is also pretty damn good. If there’s not fire blasting from the stage or fireworks lighting up the sky, there’s something interesting going on in the background. The entire stage from the backdrop to the floor is built up from screens displaying something completely random from song to song. One moment finds the mascots of ‘Mania’ playing Fortnight, where as another is a montage of clips of people flicking us all off with the middle finger from our favourite films, tv shows and cartoons behind ‘I Don’t Care’. 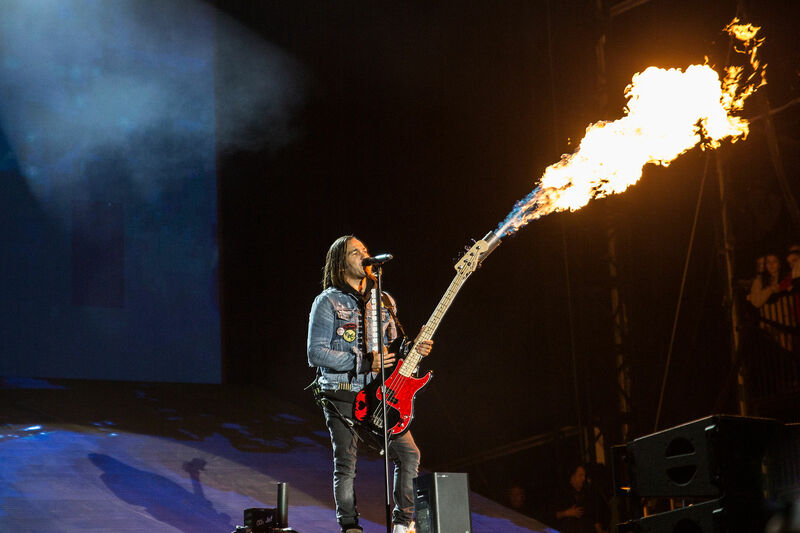 Pete Wentz emerges with the band for the encore of ‘Light Em Up’ with a Bass guitar blasting fire from it likely throwing the Leeds health and safety team into a breakdown. It looks epic as the stage bursts with flames to keep us all toasty as the cold night kicks in. 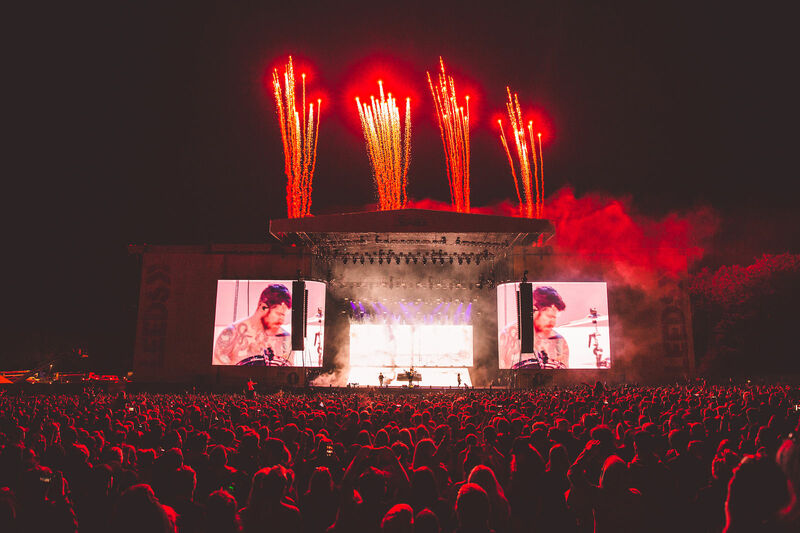 ‘Saturday’ closes the set with a firework display and Pete Wentz joining the crowd in a vintage Leeds United shirt to hand out some high fives across the barrier. It’s taken some time for Fall Out Boy to finally headline Reading and Leeds Festival, but we have to say they grabbed the opportunity with both hands and throttled as much out of it as possible. An astonishing display from one of the worlds favourite pop punk bands around. As the firework display cools down over at the main stage, a quick sprint over to the Radio 1 stage enables us to catch the second half of Wolf Alice’s (8) headline set. It seems as though we may have already missed many of the big guns like ‘Yuk Foo’, ‘Bros’, and ‘You’re A Germ’, just we managed to catch a captivating performance of ‘Visions Of A Life’ and ‘Fluffy’ before ‘Moaning Lisa Smile’ had everyone bouncing along. 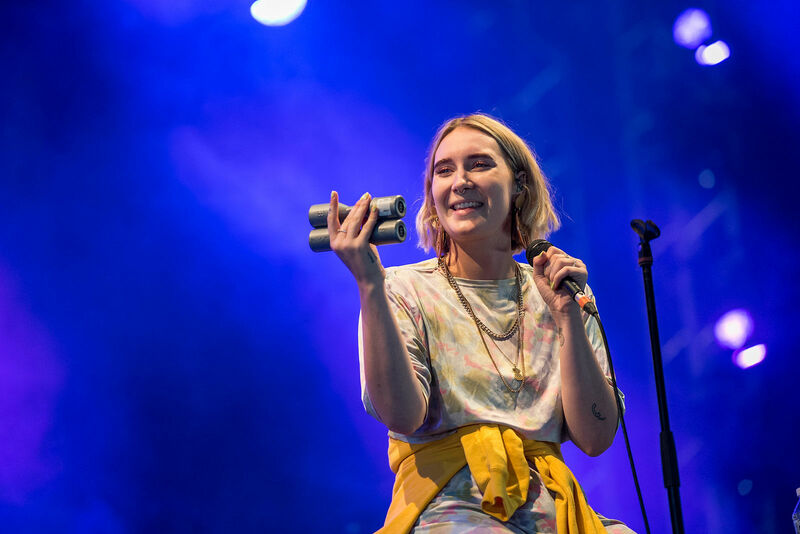 ‘Giant Peach’ closed the set with frontwoman Ellie Rowsell in the crowd being showered with pink and green confetti falling from the roof of the Radio 1 tent. You can tell by the sheer effort and grins plastered across their faces at the end of the set how much this really means to them, and it’s great to see one of Britain’s best rock acts topping the bill at Reading & Leeds festival.